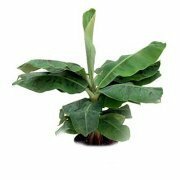 Dwarf Cavendish banana tree (Musa acuminata) is really a perennial herb with a trunk composed of layers of overlapping leaf stalks rather than wood. 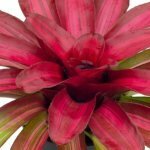 This attractive plant with its big, shapely bright green leaves and delicious fruit is the hot trend for indoor gardens. Often seen growing in botanical gardens and backyards, as they can get rather large; however, the dwarf banana tree is perfect for growing banana plants indoors. For decorative purposes, this striking ornamental tree ideal for providing an exotic, tropical feel to any room. This fast-growing, vigorous tree can grow up to six (6) feet indoors and produces tasty nutritious bananas. When grown under optimum conditions, clusters of reddish violet flowers will appear within a year and yield fruit. And the best thing about this plant is it will bloom at any time during the year based on when you plant it. There is also the Super Cavendish which is even smaller for those with less space. The Dwarf Cavendish will grow up to about 6 inches or 15 cm long. Once the bananas are fully developed (plump and green), you must cut the bundle off and hang it in a cool, shady place to ripen. Now, your can enjoy your home-grown bananas. after that. Light: Provide 12 hours of indirect sunlight a day by placing plant near a south-facing window for optimum light exposure. In the case, you do not have adequate lighting, supplement with a grow light, or a high-intensity light of 100 watts or more. Direct sunlight is essential for the fruit to develop. Rotate the banana tree so each side of it gets equal light. Water: You always to keep the top 1 to 2 inches of soil uniformly moist during the growing seasons (spring & summer), and always remove excess water from drainage tray to prevent root rot. You should leach the soil twice a year to remove salt and mineral build-up. Humidity: Banana plants thrive in humid conditions; however, moderate room humidity will do just fine for your dwarf banana plant. If the air is dry you can use a room humidifier to maintain humidity level. 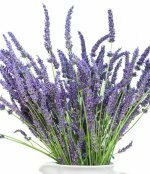 You can also spray the foliage regularly with lukewarm water. Temperature: A temperature of 65 to 75°F/ 18 to 24°C should be ideal. Keep it out of drafts and make sure the temperature does not fall below 60 °F or 16 °C. Fertilize: Feed your indoor banana tree from spring to fall with a half strength general purpose liquid fertilizer. Potting Soil: Plant in a well-draining potting mix composed of vermiculite, perlite, and peat. Soil should be slightly acidic with a pH level between 5.5 and 6.5, which is slightly acidic. Propagation – Propagate from rhizomes called "pups" produced by the parent plant. Make sure the pups have plenty of roots and replant in loose soil and keep moist and warm. 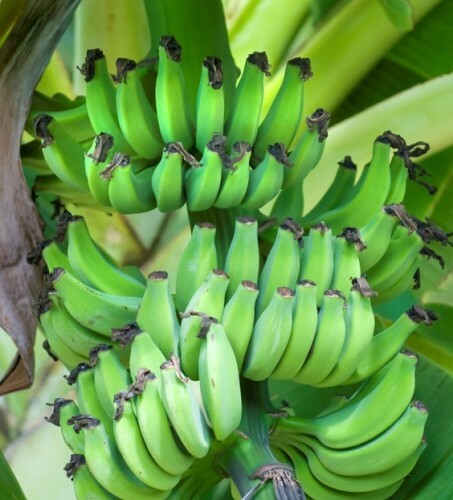 Find more about ripening and harvesting the fruit of the Dwarf Cavendish Banana Tree.